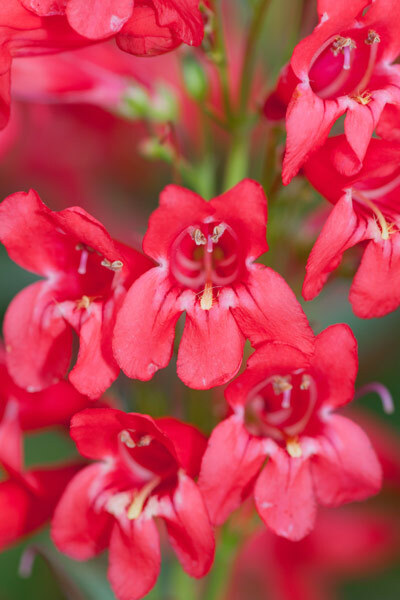 Penstemon is a western United States native that has colorful tubular flowers on tall spikes that bloom summer through fall. This prairie plant thrives in hot, sunny conditions and is a stunning addition to wildflower plantings. Another common name is beardtongue. 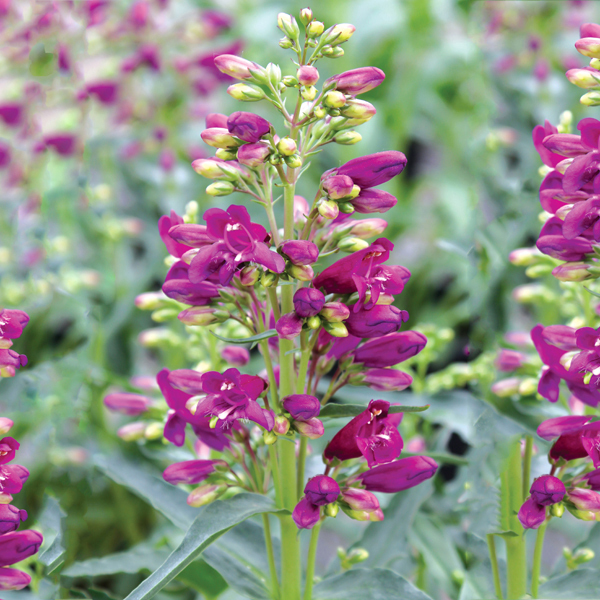 Penstemon forms dense spikes of tubular flowers in early to mid summer. Flower colors include pink, blue, red, purple, and white. The plants grow 1′ to 3′ tall, depending on the variety, and look best planted in groups. Smaller varieties are good for rock gardens and the front of the border, while taller types are best in the wildflower plantings or in the back of the border. Penstemons are easy care/low maintenance plants that are good for cut flowers. They also attract hummingbirds and butterflies. They prefer a location with full sun and well-drained soil. They thrive in loose, gravelly soil, and will do best in raised beds, or on hillsides and slopes. Choose a site where the plants will have plenty of room; penstemons don’t like to be crowded. Plant them in spring, spacing plants 1 to 3 feet apart, depending on the variety. Prepare the garden bed by using a garden fork or tiller to loosen the soil to a depth of 12 to 15 inches, and then mix in a 2- to 4-inch layer of compost. Dig a hole twice the diameter of the pot the plant is in. Carefully remove the plant from its container and place it in the hole so the top of the root ball is level with the soil surface. Carefully fill in around the root ball and firm the soil gently. Water thoroughly. Apply a thin layer of compost each spring, followed by a 2-inch layer of mulch to retain moisture and control weeds. Water plants during dry periods (when rainfall is less than 1” per week). Roots, do not go deeply. Water to a depth of three to four inches. Allow the soil to dry between watering. Add general purpose fertilizer when planting, and every four to six weeks during the season. Cut spikes when in full bloom, and place in your favorite vase. Or, leave them in the flowerbed to attract hummingbirds. After blooming, cut back spent flower spikes. This will promote re-blooming. After the first killing frost, cut stems back to an inch or two above soil line. Divide the plants every 3-5 years. Simply dig up mature rhizomes, and replant them.